The contrasts between the two candidates—and their GOP rivals—have rarely been so publicly stark. Against the backdrop of the Flint water scandal, the two remaining Democratic rivals clashed Sunday night in one of their last debates. Rarely have the contrasts been so publicly stark. Between the two candidates, of course, as well as with their GOP rivals. Where Florida Senator Marco Rubio last week blamed Democrats for “politicizing” the Flint crisis—a crisis in fact that was “politicized” at its inception, by cost-cutting GOP politicians guided by a cruel political calculus in which black lives plainly don’t matter as much as white ones—Hillary Clinton and Senator Bernie Sanders proved they understand the role politics and racial indifference played in the Flint tragedy, and that they’ll make it their task to challenge both. That’s a good point, Anderson. Listen, I suppose they can trust the corporations who have destroyed Flint by a disastrous trade policy which has allowed them to shut down plants in Flint and move to China or Mexico. We could trust them, I’m sure. Or maybe—you know, maybe, Anderson, tell you what—we should—maybe we should let Wall Street come in and run the city of Flint, because we know their honesty and integrity has done so much for the American people. The crowd mostly loved Irascible Bernie, and that’s whom they saw most of the night. Clinton immediately went into the weeds—in a laudable way—on everything from specific solutions to the immediate Flint crisis to removing rodents from decrepit urban schools. The contrast with Sanders was clear: He hit broad themes, showing how bad trade bills, Wall Street deregulation, and environmental degradation had caused the problems the nation faces. For Sanders, only a thoroughgoing change of priorities, driven by a participatory revolution, will remove the conditions that cause scandals like Flint. In the meantime, though, what happens to the people who are suffering? That’s where Clinton was strong and Sanders seemed far less engaged. Take the issue of the 2008 auto bailout, perhaps the thorniest of the debate, on the eve of Tuesday’s Michigan primary. The funds, which saved an estimated 1.5 million jobs, were tucked inside the odious Troubled Asset Relief Program, or TARP—better known as the bank bailout—which Sanders opposed. So he voted against the double bailout bill. The Bush administration negotiated the deal. Were there things in it that I didn’t like? Would I have done it differently? Absolutely. But was the auto bailout money in it—the $350 billion that was needed to begin the restructuring of the auto industry? Yes, it was. So when I talk about Senator Sanders being a one-issue candidate, I mean very clearly—you have to make hard choices when you’re in positions of responsibility. The two senators from Michigan stood on the floor and said, “We have to get this money released.” I went with them, and I went with Barack Obama. You did not. If everybody had voted the way he did, I believe the auto industry would have collapsed, taking 4 million jobs with it. That exchange sums up the night—and the entire campaign. Clinton bested Sanders on the issue of guns. 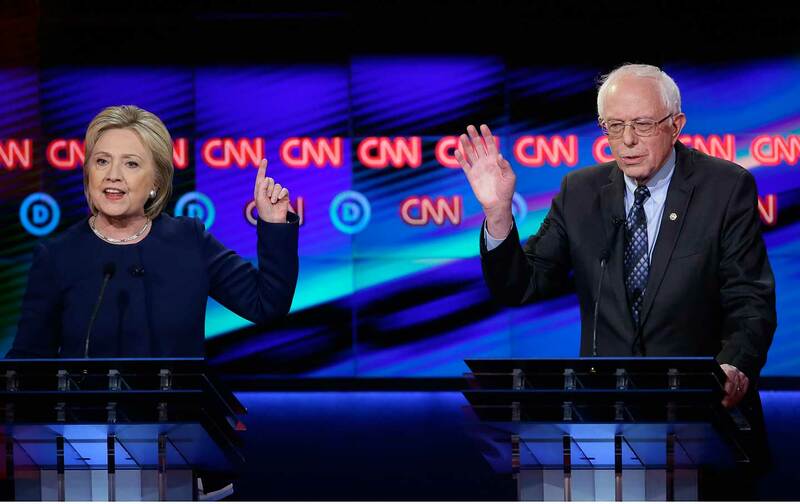 When the father of a girl gravely wounded in the recent Kalamazoo mass shooting asked what they would do to prevent future gun violence, Clinton hit Sanders for voting to give gun manufacturers immunity. It was an odd moment: Sanders has seemed to regret that vote during the campaign, and even cosponsored a bill this term to reverse it. But on Sunday night, he insisted that “if they are selling a product to a person who buys it legally, what you’re really talking about is ending gun manufacturing in America. I don’t agree with that.” I’m not sure how to square his earlier support for an anti-immunity bill with what Sanders said Sunday night. I may shock some people by saying I didn’t think Sanders’s repeatedly admonishing Clinton to let him talk—“Excuse me, I’m talking” may have trended on Twitter, so quickly did it light up social media—was sexist. I think we’d see the same indignation and finger-wagging if his opponent were a man. Sanders wants to win, and after a promising start to primary season, the last two weeks have been tough. He played the debate to win. Never mind that nearly half of Americans in poverty are white, or that the word “ghetto” sounded dated back when Elvis Presley sang about it. Sanders showed again that he equates “black” with “poor” and racism with economic inequality, and that message, to date, has not won over African-American voters. It’s unlikely to start working in Michigan, but we’ll find out Tuesday. Here is the difference. It’s not a personal difference. We just do things differently…. We have a corrupt campaign finance system. And what Secretary Clinton is saying and what every candidate who receives from the fossil fuel industry or the drug companies or Wall Street say, “[That’s] not going to impact me.” The question the American people have to ask is, why are these people putting millions of dollars into candidates if it’s not going to make a difference? We’ll see tomorrow whether Michigan voters share Sanders’s suspicions of Clinton’s corporate donors.